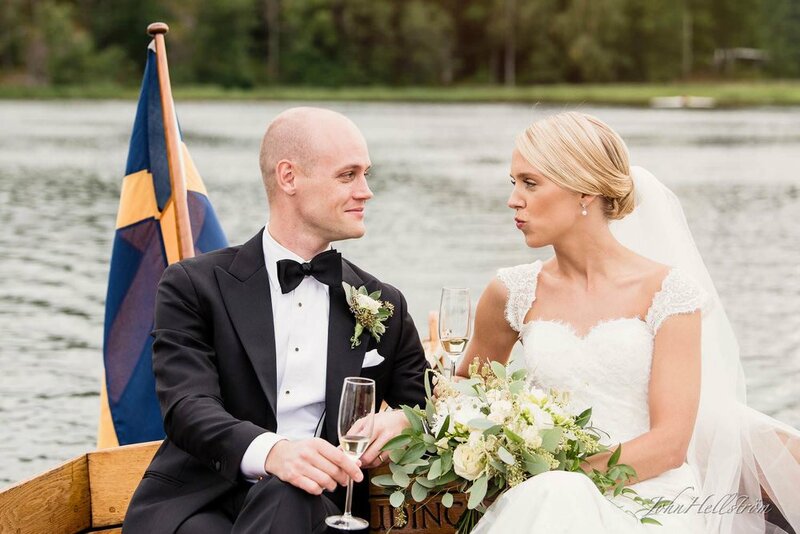 I had the pleasure of photographing Anna and Magnus during their happy wedding day. 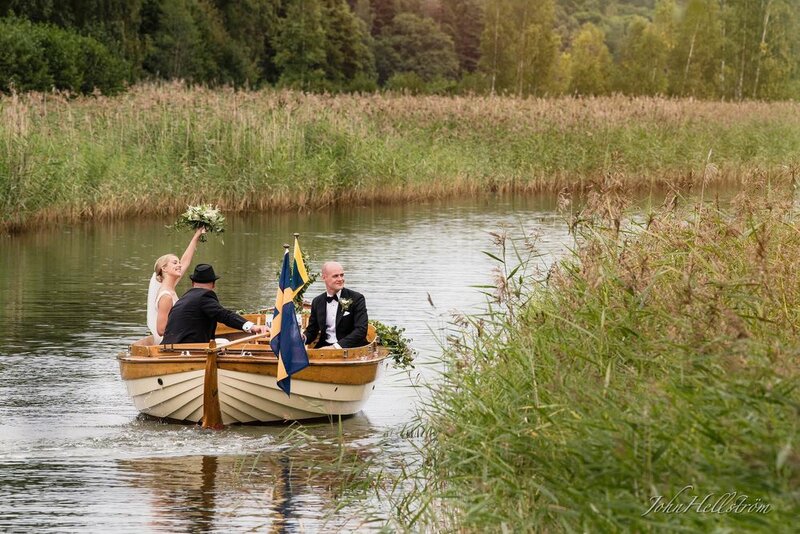 They married in Ingaro Church in Stockholm, and then went from there by boat. 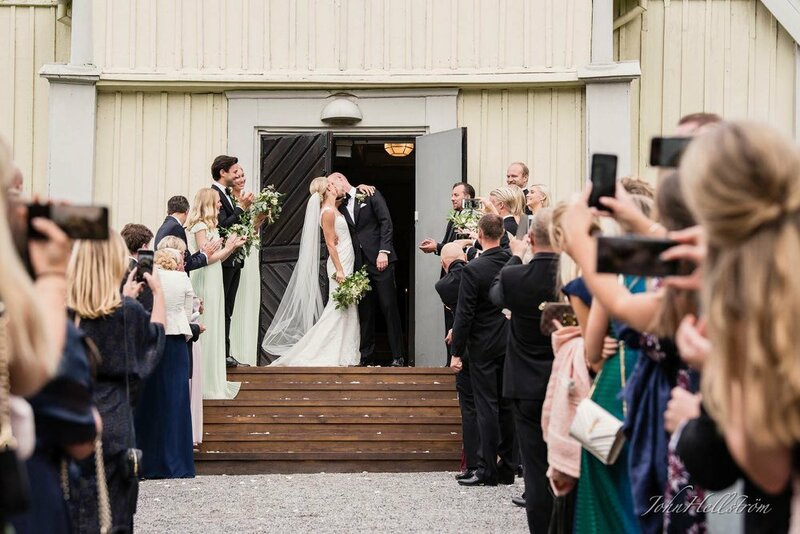 After the boat trip, the bride and groom were picked up by car and went to the beautiful Saby Sateri, where the wedding dinner and reception were. Wikipedia writes about Ingarö Church (free translation): "The church was first built as Pilham's chapel in lying timber. Later, the church has been clad with a standing panel and changed its name to Ingarö Church. The chapel was completed in 1792. In its form, the building is a church with a wider, narrower sacristia in the east and a wider narrower gun house in the west. The church is resting on a fairly high base of tarved gray gravel. All building parts are covered by a poorly broken mansard roof covered with tarred roofs." Saby Sateri describes themselves (free translation): "At Säby Säteri you are staying in a genuine 19th century manor house surrounded by forests, meadows, lakes, live farms and sea wrecks - all close to central Stockholm. The tranquility of the surroundings, along with our personal touch and award-winning service, make You can be inspired during your conference, make the wedding of your dreams or relax during a lovely weekend. The feeling of being in the middle of nature is right next to the dinner table. The restaurant is inspired by the seasons and the shifts of nature. Our kitchen embodies high ambitions with a tastefully composed menu and great love for the nerded and reproduced. In addition to all the delicious tastes, you will experience genuine crafts during your stay at Säby Säteri. Together with Värmdö Brewery, Värmdö Musteri, Värmdö Bränneri and Säby Gård Rapspresseri we offer impressions and tests at Smakriket Säby - an activity that guaranteed to give a wonderful experience to your kickoff or your corporate event."